The 15th Guimbal G2 Cabri for a UK customer has arrived in the UK after a delivery flight from the factory in France. 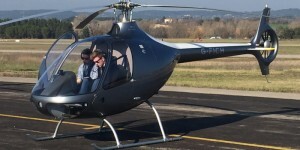 This aircraft is the third purchased by Helicentre Aviation, who also have two other examples leased from Cotswold Helicopter Centre – the distributor for UK and Ireland. Serial 1131 is the first of eight new Cabri helicopters on order for delivery to the UK over the next five months. It is registered G-FICH, and is in the operator’s corporate grey colour scheme. The Guimbal G2 Cabri is an all-composite two-seat helicopter, and is powered by a Lycoming O-360-J2A engine. The G2 Cabri is well supported in the UK, with eight Part 145 maintenance organisations approved by the manufacturer. This will form the backbone of further fleet expansion.